Happy Monday readers! Beginning of another week, and a full weekend rested after a very satisfying arThursday! 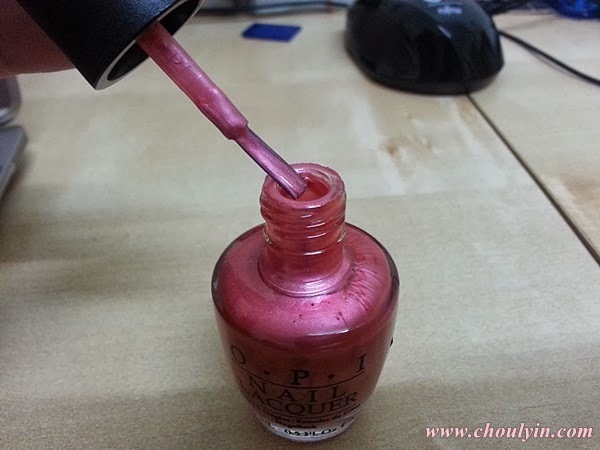 As you can see, it is a bright pink shade with a slight pearl finish, and as with all other OPI Nail Lacquers, it doesn't contain DBP, toluene or formaldehyde. After applying the nail polish, it comes off as looking a little frosty, not like how it looks like in the bottle. For me, it's a pro and con thing, cos it looks nice on my nails, but it looks different on my toenails :/ In the applications below, I have applied two coats, and you can see for yourself how pretty they look. This is the colour against the sun, it looks darker and metallic-ish. This is the colour with the sun behind me. The colour turns a little lighter, and much more suited to those working in a more corporate environment. Verdict: 7/10. You would expect the quality of the nail polish to be good, considering it's OPI, and it is. It lasted me almost two weeks, without a chip, and even when it started chipping, chunks of it doesn't come off, like other polishes that just disintegrates once it starts chipping. It looks good applied on the nails, making your hands looks very feminine, but personally for me, I feel that it's a very big NO NO if you want to apply it on your toenails. If applied on the toenails, the colour comes off as looking a little gypsy-ish, and not my cup of tea. Last comments: On it's own, it's a fairly good shade to own if you love pink or the variable colours, but if it were to be part of a collection, I wouldn't say it should be in the Amazing Spiderman Collection, it would suit the Minnie Mouse Collection, or even the Mariah Carey Collection more. 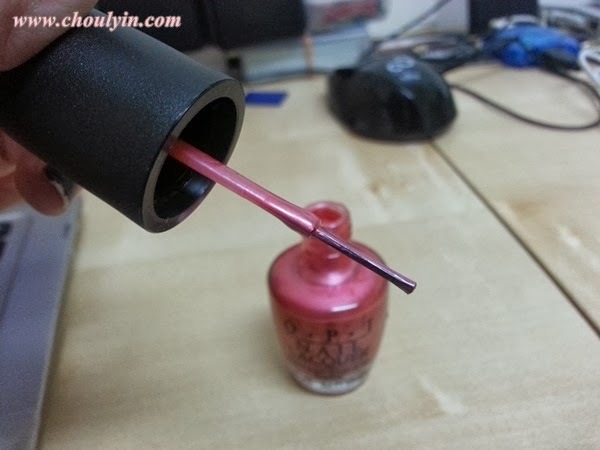 The OPI Nail Lacquers retails for RM63.00 at selected Nail Parlours, and is also available at Amazon.com for $9.00. One of my fav OPI collection.. I love the duo chrome effects.. YWOM is a gorgeous frosty pink shade that goes with anything! I'm a sucker for all things pink! Lol.. I absolutely love OPI polishes, but I tend to wear color on my toes more often than I do on my fingers, so I may have to pass on this one, based on your recommendation! Great, thorough review! I didn't buy anything from this collection and I totally agree with you, this colour doesn't look like it's part of the Spiderman collection. It looks too cute for that. I've never tried a nail of this brand even if everybody talks about it. I'm sure I have to try it. The color you are wearing is bold and warm...perfect for this period of the year while the summer is leaving us. I like the shade... but I agree with you, it is weird in the spider man collection! Lovely shade, great for Fall! I wanted to get the OPI set on hunger games have you seen that? i love the shade! :D i didn't even know opi had this spiderman collection! I love that OPI is a 3-free brand. It sounds pretty good if it lasted a full two weeks! This color look so good on you!! they do??? OMG I would love to get that set! they do don't they? Wished I had the entire box! Opi!! 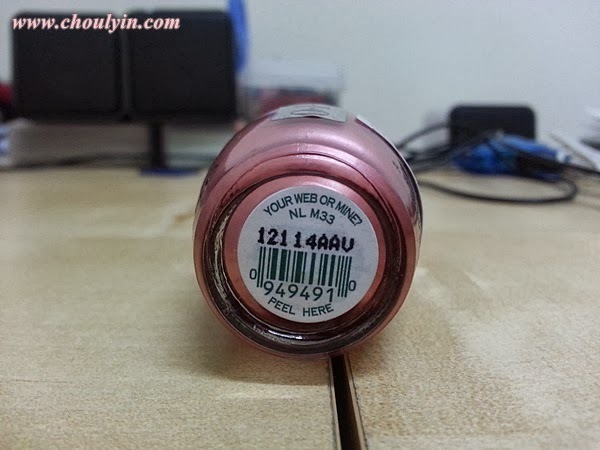 always love opi nail polish :D it looks pretty on you! Love the colour on you Nail girl... Everyone's talking about Nail Lacquer these days .. I'd love to try one.. This goes into the shopping list of the next month ! !